Icy Strait Point in Hoonah, Alaska is an authentic salmon cannery dating back to 1912 located in Alaska’s largest Native Tlingit village of Hoonah (about 35 miles west of Juneau). 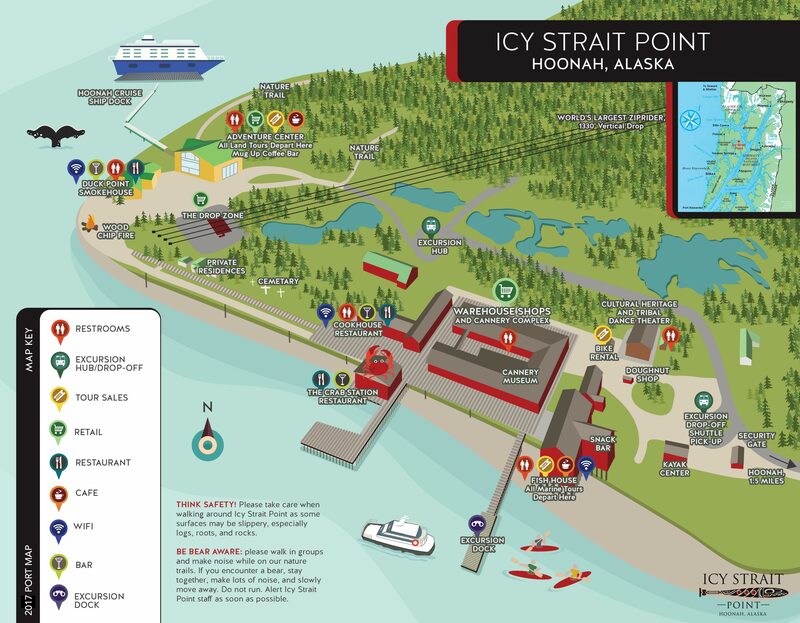 The port area features locally owned shops and restaurants operated by the Huna Totem Corporation, an Alaska Native corporation formed under the terms of the Alaska Native Claims Settlement Act, which purchased the cannery in 1996. Surrounded by towering rainforest and the abundant waters of Port Frederick and Icy Strait, Icy Strait Point is a destination that offers unparalleled access to adventure, wilderness, wildlife, and genuine Native Tlingit hospitality. The port offers over 20 excursions where guests can learn about Native Tlingit culture, search for wildlife, hike on the of the mountain, explore the coastline, drive an ATV, Jeep or boat, go fishing or for above the port on a zipline. Icy Strait Point welcomed its first cruise ship, the Celebrity Mercury on May 23, 2004. Since 2004, the port with roughly 85% of the staff calling Hoonah home, has hosted over 1.6 million visitors. This is an impressive statistic considering Icy Strait Point is a cruise destination and is only open to cruise passengers and the public when a ship is in port. For additional information please visit the Icy Strait Point website. Scroll down the page for the webcams labeled "Looking down the ZipLine at Icy Strait Point" and "Looking out at Icy Straits" as these will provide you with a view of the cruise ship berth. Everything is wilder in Alaska, including a 60-mph zip line with views of the forest and Icy Strait. Speed down the highest zip line in the U.S.-then hop on an ATV for an off-road adventure through scenic terrain. Go off the beaten path in a Jeep Wrangler, exploring the wilds of Chichagof Island in search of wildlife and adventure. Adventure starts early for kids at this outdoor zip line park created just for 4-year-olds to 6-year-olds. Explore the bird diversity of Hoonah's lush temperate rainforest and its surrounding tidal waters with a local expert. Venture on a fun-filled quest that inspires teamwork and togetherness. Angle for halibut at one of Icy Strait's hottest fishing spots-then send your catch back home to enjoy later. Climb to see panoramic mountaintop views and paddle to look for sea life near Icy Strait. Enjoy a scenic drive through Alaska’s largest Tlingit settlement, followed by a live performance from the Huna Tlingit. Explore Chichagof Island in the comfort of a private van with a guide who will plan an itinerary of your choice. Experience a traditional Tlingit cultural performance before enjoying a seafood feast. Soar above the Alaskan wilderness at this multi-level zip line park. Cruise the waters of Icy Strait aboard a catamaran in search of humpback and killer whales-sightings guaranteed. Board a high-speed whale watching boat and cruise the eco-rich waters of Icy Strait in search of orcas and humpbacks. Look up at the trees as you hike up Hoonah Mountain and then down at the canopy from a multi-level zip line park. Cruise around Port Frederick to see amazing wildlife and help take readings of the local ecosystem. Discover the fascinating geology, history and culture of Icy Strait on a 2-mile guided walking tour from beach to rainforest. Enjoy a guided tour through the rainforest in a covered tram and see the deer, bears and eagles that call the area home.